The Cherry Cremation Urn is made in the Pacific Northwest. Designed from furniture grade hardwood plywood with 1/8 inch cherry veneer, this affordable urn has the look of a solid wood urn. The urn you receive will appear lighter in color and will gradually age to the richer, darker color shown. Cremains are easily loaded through a bottom opening panel attached with screws. As with all urns, it is important that the cremains be kept in the sealed plastic bag you received from the funeral home, and place the bag inside the urn. 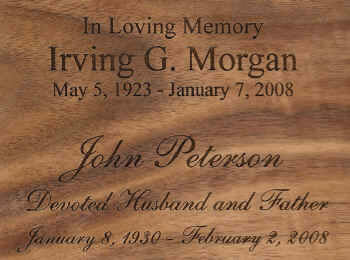 Engraving is available on the wide front of the urn, narrow long side (spine) of the urn, or top of the urn. Please limit engraving to no more than 35 spaces per line. Check engraving information to be sure spelling, punctuation, capitalization, and dates are correct. Engraving will be done exactly as submitted. Usually ships 2-3 business days after order is placed. Ships from the West Coast.